Mothership: Your installations bring together light and sound to create spaces for listening and seeing. And your works like CUBEMUSIC and Sun Boxes seem interested in helping to dissolve the false wall we have constructed between sound and vision. In Install, the short documentary on your work, you spoke about a memory of seeing space by way of fireflies. You then remarked that Sun Boxes is sonically like the firefly field with its notes appearing and disappearing. In Install you also mentioned that sometimes you see something that reminds you of a sound, or hear a sound that reminds you of a thing, or let’s say texture. Of your installation CUBEMUSIC you said: “CUBEMUSIC—I saw the metal and I could hear it.” Was this experience of seeing-as-hearing in the process of making CUBEMUSIC? Are you speaking about the cut metal, the shapes that cast light and shadow? Did you cut out the metal first and then make the sounds? Craig: The metal was presented to me. It took some time for the idea to gel, but once it did I could hear what it should sound like when I looked at the surface of the brushed CUBE. I remember seeing a funeral procession making it’s way through the streets. It was a very distinct group of cars, the first few had the little plaques poking up from their hood and then a long trail of cars behind. They all had their lights on. Then it started to rain I looked around and saw the drops cover the city. Then as I looked at the funeral procession I could no longer see where it ended and the cars with their lights on due to rain began. I think this is one of the many elements that went into CUBEMUSIC. MS: Can you tell us a bit about CUBEMUSIC—what it is and how it works? 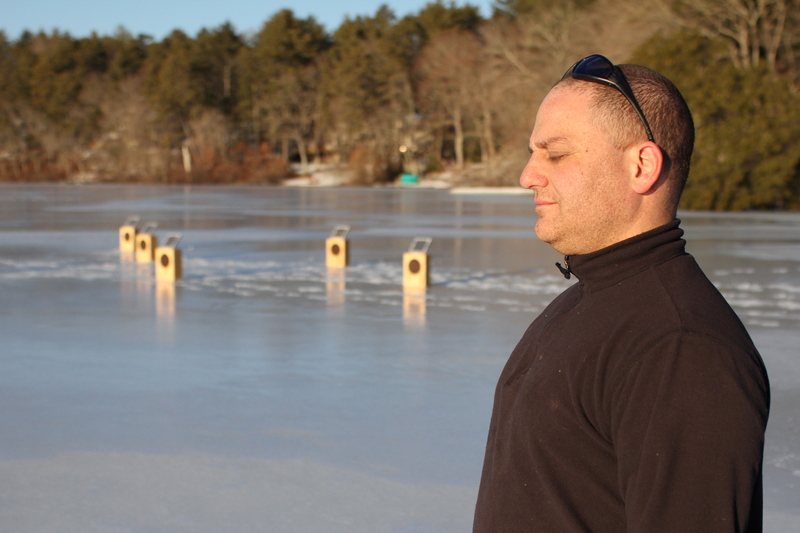 Craig: In 1996 I was living in a mansion in Waterbury, CT, with my two best friends. Joel Westerdale, drummer of Diving Bell and Ryan Blessey blacksmith and friend since age 13. Ryan’s family business was a sheet metal shop. They cut, bend and weld all kinds of metal in many interesting ways. They have a laser press that cuts parts of a sheet to be used for something, then the remaining piece, a sheet with holes in it is referred to as a skeleton. The skeletons are usually recycled. One day Ryan came home with a pile of metal, when I asked what it was he replied; “Garbage, I didn’t have any room left in the dumpster. Leave it alone.”  I immediately took some and hung them up in my room. They were beautiful, I was in awe. I sat around for hours just looking at the 4 foot by 6 foot pieces of metal. These particular skeletons were from parts that were cut out and used as cell phone holders in Porsches. I thought it looked like a language. While all this was happening Westerdale and I were in and out of Mike Deming’s studio in Hartford, CT.  It’s a big industrial building once manufacturing guns. His studio is called Studio .45, the building is still referred to as the Colt building. That year I spent a lot of time recording various projects at Studio .45 and I have very fond memories of watching the sun cast shadows in the space through huge windows. I felt like I could see the sun stretch over every inch of the place. There was one corner in the lounge area that had particularly beautiful shadows. A cluster of pipes made an intricate shadow on the wall that seemed to drag across the room as the sun moved. A few years later I called Ryan collect from a payphone in Brooklyn. I wondered what it would be like if we made those skeletons in to CUBES and project sound and light from within them. At this time the shop wasn’t making any of those Porsche cell phone holders, so Ryan agreed to recreate the skeletons. One thing led to another and now there are 6 4X4 CUBES that have different shapes cut out of them. A circle, square, rectangle, triangle, tool punch and the original hieroglyphics. There are 3 light sources in each CUBE that glow and decay at different intervals. Inside each CUBE is also a pre-recorded 4 note guitar chord swelling in volume. The Sound takes 28 days to cycle through. CUBEMUSIC is the sound, light, and metal but the room it’s in becomes the piece. Shadows come in  and out of focus and stretch as the light sources change intensity. One of my favorite details is standing in front of two CUBES. There shadows start out crisply on the floor and walls as two distinct patterns slowly meshing into each other blending into unidentifiable shapes and then the process starts all over again. MS: You mentioned another memory, of being fourteen and fascinated in the paradoxical way that fireworks’ light casts shadows at night on the bushes. 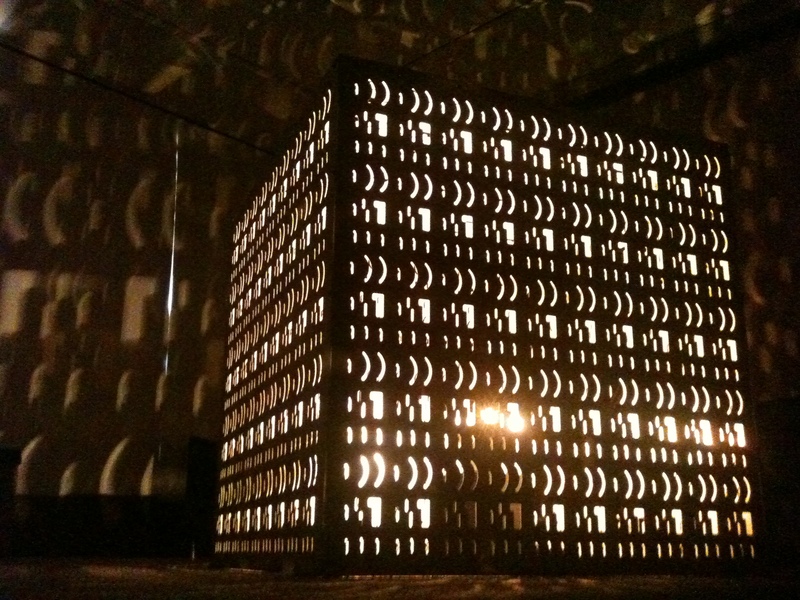 This fits the feel of CUBEMUSIC, which makes a gallery space into a box of shifting light. 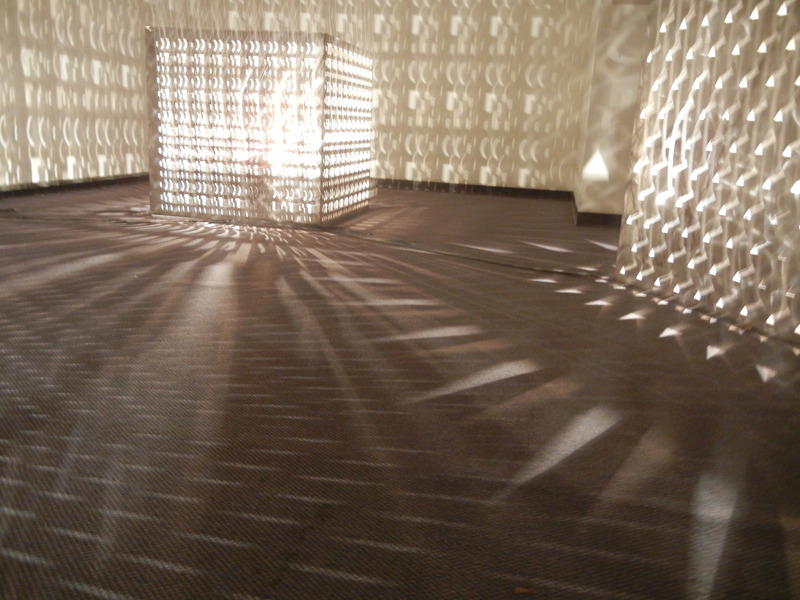 I think of it as creating an environment that’s a little bit like Bryon Gysin’s “dream machine.” While your installation is not flickering and designed to provoke a hypnagogic state, it is similar in the play of light and shadows that breaks with our usual vision and might move a person inward into a more open and generative state. Any thoughts on Gysin’s dream machine or other influences on how you work with light? How do you see light and sound working together? How do you think the lights in CUBEMUSIC affect a person’s experience of being in the sound? Craig: I have never seen a Dream Machine. I’ve seen some videos. I assume I would like the experience. The lights of CUBEMUSIC allow the participants to be in the moment and not get distracted by the mechanics of the music. It takes a few minutes to get used to the room and then there are a million details slowly unfolding in the space. MS: How does being immersed in the sound and light of CUBEMUSIC shape one’s sense of space or time? 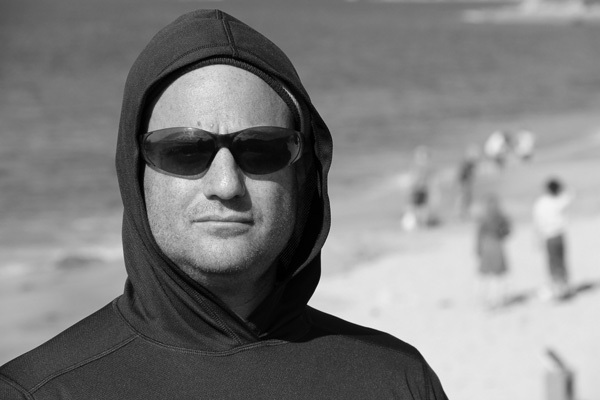 Craig: I’m continuously trying to create a scenario where the participant can be present. We are constantly coming and going, and there seems to be fewer opportunities to be in the moment. Sound and light are just tools to get there. MS: From punk-rock to long notes in contemplative spaces—what were some of the influences that changed your relationship to music/sound and moved you into making installation art? I am sure it was many encounters along the way, including visual artists. In speaking of wanting to make pieces of long duration, in the film Install you mentioned “eternal music,” which of course brought to mind La Monte Young. Has he been an influence? Who else? Whose work helped the most in opening up new possibilities? What is it exactly about their work that intrigued or delighted you you? Craig: I stumbled into La Monte Young’s Dream House very randomly. At the time I was getting a little restless being in bands. I remember being on tour with Westerdale thinking we could do more. We’re resourceful guys. We like a lot of stuff. We came back from that tour and did a piece called Maschine. We both worked at a print shop and composed a piece for instruments and two off-set presses. It was definitely the beginning of something. We practiced in the shop at 4am before everyone came in. It was great. I liked starting my day before everyone else. The Rothko Chapel was another indicator. I have always loved the heaviness of Rothko and the piece “Rothko Chapel” by Morton Feldman blew me away. So much so, I smuggled a portable CD player and headphones into The Rothko Chapel and listened to it. It was a very intense combo. I later read somewhere that the definition of a sacred space is one you tremble in. I didn’t realize it at the time but I trembled in The Rothko Chapel with Morton Feldman in my ears. MS: Before we go any further, can you briefly describe the Sun Boxes? 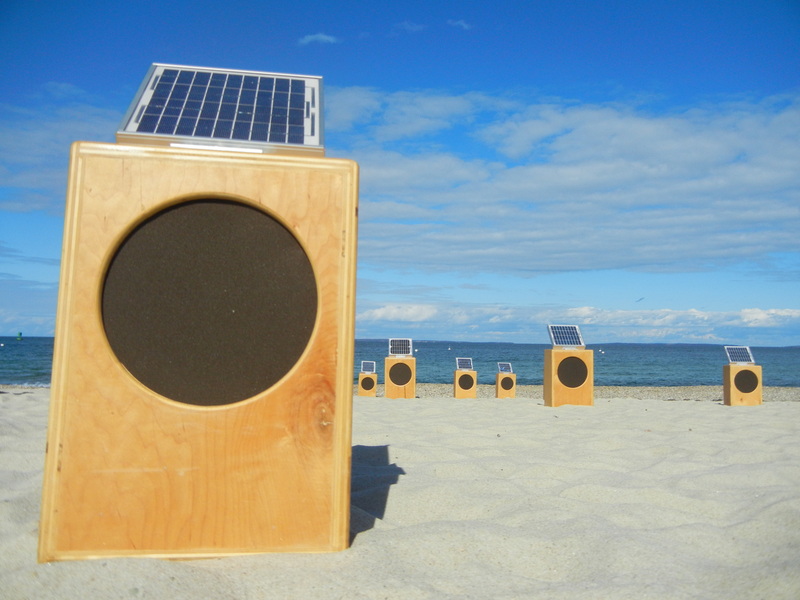 Craig: Sun Boxes is 20 solar powered speakers each playing a recording of a single guitar note. Each of the notes is a different length, so the whole piece takes 3.12 months before it repeats. The sound is powered by direct sun light and there aren’t any batteries so the main variable is volume. More sun = more power =more volume. On cloudy days the sound is quiet, and if the clouds are really dense sometimes the sound stops all together. Craig: The music as composed to be heard outside in the daytime. I really wanted it to feel uplifting and nourishing like the sun itself. There is a heaviness with the chords of CUBEMUSIC; I wanted to try something else. Bb seemed like the perfect starting point. I made about 7 or 8 recordings of different Bb chords and went to Florida with my wife. We swam in the ocean and listened to various Bb chords. I immediately fell in love with the Bb 6 and I’m still happy with the choice. What I love about the Bb 6 is the tinge of dissonance that appears but ultimately everything resolves. It’s very soothing with the faint possibility of a thought-provoking avenue, or not. MS: In the film Install, you mention duration being important, but in listening to the sound and seeing the spaces you make for people to experience that in, what seems to be more at issue is immersion. Duration offers the possibility of deeper immersion, within which, the ear can come to experience the sound (whether brief bursts or long notes) as increasingly intricate. In thinking about of the duration of sounds in La Monte Young’s work, noise/media scholar Douglas Kahn writes in Noise Water Meat, “a person did not listen to a sound, but listened inside a sound”—this “inside-a-soundness” seems very much what Sun Boxes does, what all of your installations do. How do you think that the immersion in Sun Boxes, which are in outdoor settings, affects people’s sense of place and space? Craig: Because Sun Boxes is outside I usually end up installing the piece in place that has a very strong feelings for people who come. Like a park or a beach. It’s where people’s lives happen so they are very familiar with the space. Quite a few times people have things to me like; “I’ve been coming here for 20 years and standing here with Sun Boxes has allowed me to see things I’ve never seen.” Or “Your Sun Boxes have transformed this space. I will always think of them when I come here.”  People have also described the sounds of Sun Boxes as familiar on the first listen. The immersion of CUBEMUSIC helps keep the participants from being distracted by other things. The immersion of Sun Boxes includes everything in the immersion. All sounds from the ambient landscape become part of the composition. Participants move through the space with a different purpose. MS: There’s an anthropologist, Tim Ingold, who writes about perception. In a couple of essays he talks about listening and looking as not two separate things. That each are immersive and also function as a whole-body experience. Following this line of thought, it would seem that in Sun Boxes people are participating in an “ordinary” outdoor space that is heightened and made new by sound…that by listening, they are seeing more…that in a sense, they are listening to the grass and ground and clouds more with their eyes and feeling the sound of the light on the surfaces of things, hearing the sunlight on their skin. What do you think? Your work tends to involve sight and sound simultaneously—what do you think about listening and looking being not two separate things? 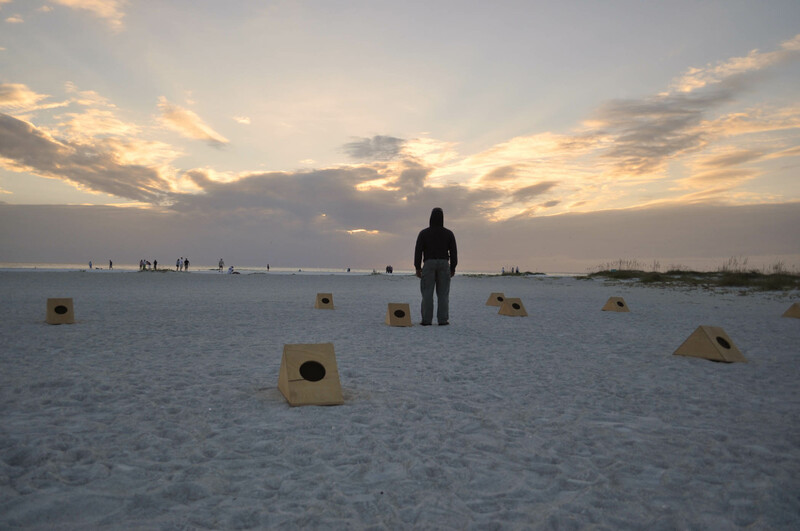 Craig: The sound of Sun Boxes allows for time to slow down. It gives participants the chance to see all the things that are already happening around them. Music is so seductive. It really affects our moods and perceptions without us even realizing it. No one has ever left the array more stressed out than when they arrived. I don’t think most people realize this while it’s happening to them. MS: What are some places that Sun Boxes has appeared? Do you record every installation? The differences in each session comes in part through the weather and clouds that day, but differences also come because it’s an open field for chance participation, with children running around and birds passing through—what stray sounds have been most beautiful to you when you heard the recordings? Craig: This wasn’t recorded, but in Turners Falls, MA an ambulance drove by the installation full-bore with sirens and flashing lights. It was like a study of sound. I was in the array of Sun Boxes and heard the ambulance getting louder as it approached and getting quiet as it drove away. The sound of the waves is always nice. There is a recording from Menemsha Beach on Martha’s Vineyard and you can hear the ping of a buoy every so often. Another time on a cold windy day out of nowhere a gust of wind blew a bunch of leaves through the array. I was standing in the middle and heard the sound of Sun Boxes accompanied by a little orchestra of leaves crunching as they blew through. People often ask why I don’t do things to alter the outcome of the Sun Boxes. I am trying the get out of the way. 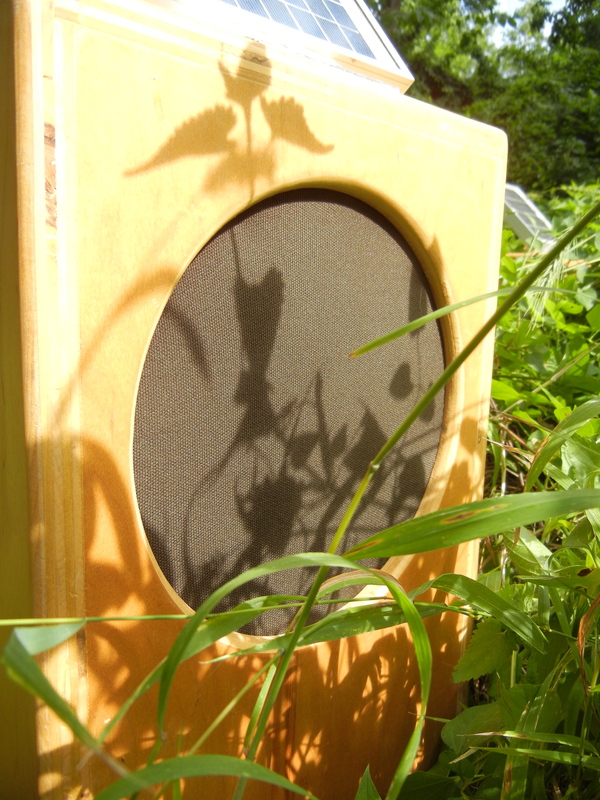 Sun Boxes is a system that improvises with Mother Nature. There have been so many beautiful moments that I could have never predicted. So I don’t even try, instead I look for the possibilities. There will always be a fine line between refining the architecture of an idea and the point of letting it go to just exist in the world. I’m still trying to fine-tune this balance. MS: A the major drive in the evolution of your work is your interest in dismantling barriers between audience and performer, to offer experiences in which people can participate. Craig: I loved being in bands and going on tour but always felt like I could do more. I wanted to make something that people could feel like they were part of. The mechanics of rock-n-roll work for that setting but my interests have wandered. MS: I understand you recently made a Sun Boxes app. How does it work? And how will it be different from the actual Sun Boxes? Do people have to plan it in advance? Craig: There are three settings in the Sun Boxes app. With “stream,” you can stream the sound of all 20 boxes on one device. With “interact,” two phones can play any combination of the 20 boxes. “Collaborate” allows 20 or more people to each play a note. The app is not contingent on the sun so it will work anywhere. The “collaborate” setting will require wifi. The app allows people to allow the concept of Sun Boxes to slip into their lives. We give you the tools to go recreate Sun Boxes somewhere. Maybe even send photo of the experience. Or not. My main goal in life is to leave this planet better than when I got here. One way I feel I can do this is to create beautiful experiences and share them with the world. This is the only app I have that encourages groups of people to get together in real tine and do something. I don’t want to spend the majority of my life with my face in a screen. MS: With your interest in immersion and participation, it’s not surprising that some years back you danced to your own tune so to speak, performing butoh to some of your music. Butoh is such a rich form! Were you trained in it at all? What did your experiences with butoh teach you about looking and listening, about space, time, patterns, motion? I hung out with some free Jazz guys in Northampton, MA. and they turned me on to Derek Bailey, the abstract guitar player. He did a record with Min Tanaka a Butoh dancer. The cover was a photograph of a twisted Min Tanaka. After seeing that I had to know what Butoh was. A few years later I joined a Butoh workshop run by Corinna Hiller. I have always been a physical guy. I played sports when I was younger I maintained a light yoga practice. I did a lot of physical work as a landscaper, carpenter, stage hand. Learning about Butoh was perfect. I joined Corinna’s company as a dancer and composer. The pinnacle was the Butoh Festival in San Francisco. I moved to my own music at The Yerba Buena Gardens. I have since left the company, but I can honestly say Butoh still effects me everyday. With Butoh, for the first time in my life I thought about movement in terms of expression. Up to this point my all my movement was a means to an end. MS: What new projects are you thinking about or working on right now? Craig: My latest piece is called Moon Phases. It will make its debut at ARTFIELDs this year April 24th-May 2nd. It’s a kinetic sculpture that plays music based on the moon. The music portion is 30-note guitar chord that gets more dense as the moon gets more full culminating with all 30 notes during the full moon. There are 7 squares each turning a quarter turn over the course of 25 hours. Resetting themselves once the moon has gone through it’s whole cycle. This version is 40”X50” and meant to be inside, but I have plans to make a larger outside version.